Once you reach Cambulo, you can have your lunch because the trip there is very difficult. You don’t have to worry the next part of the trip because it will be an easy one. 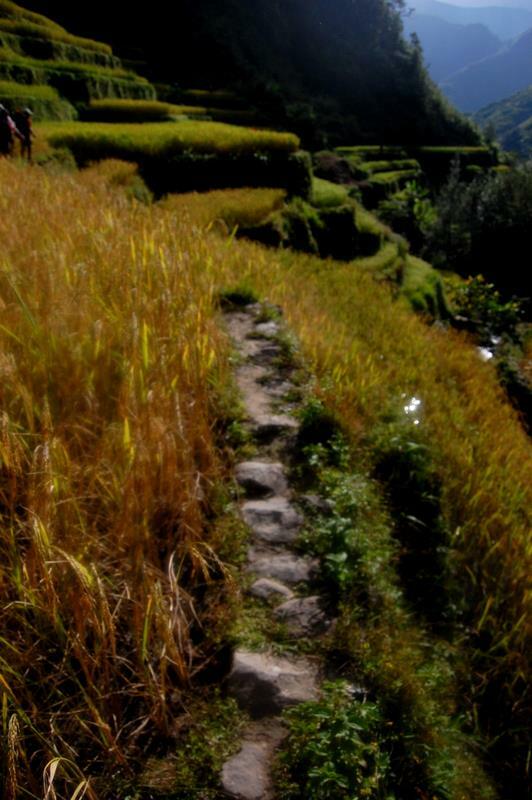 A bonus in this part of the trek is the beautiful view of the rice terraces. Cambulo is slowly becoming a tourist attraction. 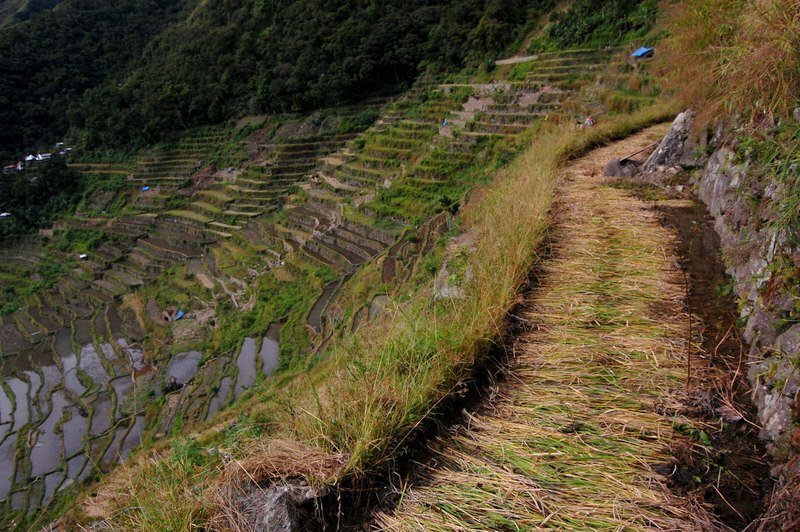 Every sweat and pain that you had for the past 3 days will be paid off once you see the grand rice terraces of Batad, which like an amphitheater. Batad is one of Cordillera’s prides that is why you can find a lot of souvenirs once you get there. We got there around 4pm and we went immediately to the Tappiyah falls because our group loves swimming, especially in between climbs. We ate our dinner and also slept at the inn. The next day, we went back to Baguio and ate at Evelyn’s Halal Foods, a good place to eat specially after a climb. Mt. Canlaon, also known as Kanlaon Volcano and or Mount Kanla-on, sits in the provnices of Negros Occidental and Negros Oriental estimated to be just 40 kilometers from Bacolod City. It is one the listed active volcanoes in the Philippines, and is part of the Pacific Ring of Fire. The volcano’s summit consist of a caldera with a crater lake, and a smaller more active crater is located south. Being an active volcano, it is home to some hotspring: Mambucal Hot Springs on the northwest, Bucalan Hot Spring, Bungol Hot Spring. Although the forests of Wasay trail are supreme, the Canlaon City trail is rich in views, affording photographic wonders from Day 1 onwards. It also enables a camp down at Margaja Valley, whose ground is filled by water during rainy season, hence it is also known as ‘Margaja Lake’. It also gives a fresh perspective on the volcano, since the climb is on the east face of the mountain. It is closer to Dumaguete City and thus affords easier access to sidetrips such as the famed island Siquijor and Cebu itself, where mountains such as Osmeña peak beckon. – Pinoy Mountaineer. Check out these links for other info on this volcano. Outdoor recreations such as hiking or camping deals with the nature. Most of us would have limited sources, for there will be no 7-11 up there in the mountain or through the thick woods of forests, thus requiring us to be bring our own stuff to be consumed for the planned activity. Much of these would be food, you need to have energy out there with wildlife, unless you are superman. Check out this video on Leave No Trace. You can visit the Leave no Trails official website by clicking here. Baguio is known for its number of hiking and running enthusiasts, but another recreation that outdoor junkies love to do in this city is Biking. There are a lot of trails that you can follow when biking in Baguio City, of course there is the road which is the easiest if you know how to manage yourself in traffic. You can also bike to Mt.Cabuyao by taking the Green Valley route. If you want to bike in a trail with a lot of obstacles, then you should try Camp John Hay’s infamous Yellow trail. 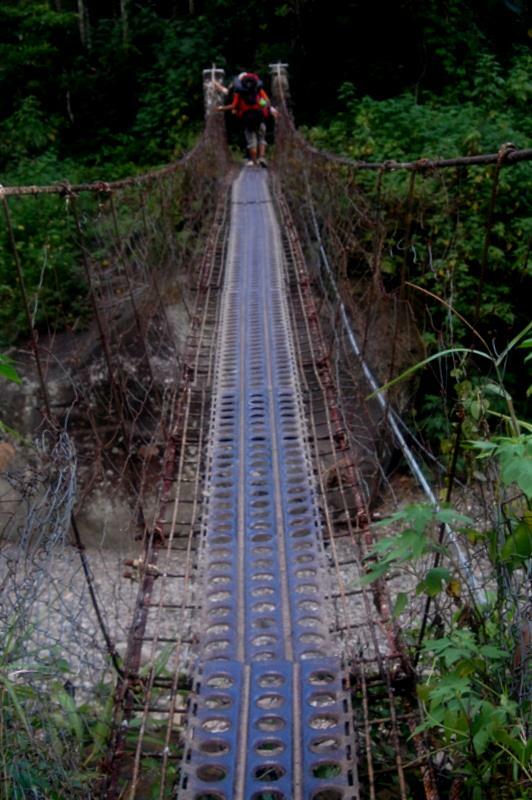 A lot of experienced bikers and runners take this trail because of its hurdles like fat roots, rocks and rickety bridges. Despite these hardships that you will encounter along the trail I can say that it is safe to attempt this route, because Baguio’s environmentalists try to maintain the area. At the start of the trail, you will see a lot of horses because the beginning of the trail is located at the horseback riding station. There will be a lot of ups and downs and you will pass along a lot of pine trees while biking or even running in this trail. It is an 8km route but it can take you 3 hours to finish this trail if you are running. They say that it was named yellow trail because of the stones that are found there. They say that these are dying stones though I don’t know if this is just a legend. You can also see a lot of panoramic views of the mountains of Baguio while you are in this trail. You will surely enjoy hiking this trail because of its peacefulness. Remember to smile to a fellow biker or runner while you are following this trail, this is a common courtesy among the outdoor enthusiasts of Baguio City. Try not to litter anything while you are in this part of the area, this is one of Baguio’s most loved trails and a lot of running events are held in this area. Mt. Arayat lies within the flats of the Central Luzon, with two peaks, one is in Arayat, Pampanga (1008 MASL) and the other one is in Magalang, Pampanga (1030 MASL). 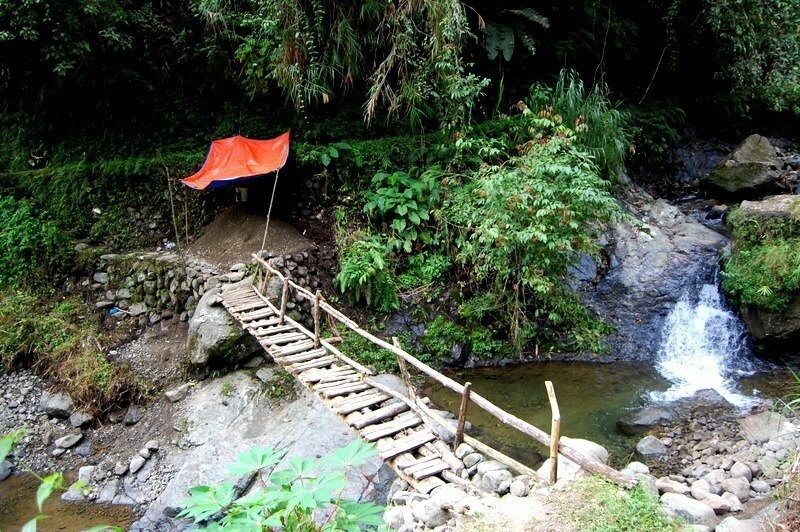 It is considered a mystical mountain, the legendary home of the fairy Mariang Sinukulan. One can start trekking in Mt. Arayat National Park, located in the town of Arayat, Pampanga, 2 and a half hour from Manila via North Luzon Expressway from Monumento. Trek to peak one could take to atleast 4 hours – 5 hours and you can set camp at peak and have lunch there. One can then go to Peak 2 in Magalang, Pampanga or descend back to Mt. Arayat National Park where you can bath to its natural pools. If you decide to stay overnight, be aware of stealing monkeys. Challenge yourself! This is the unwritten mountaineer’s creed that is on the mind of every hiker. We know that there can be a lot of trails for reaching the peak of a mountain and that most beginners hike through the fastest route. In going to Mt. Cabuyao and Mt. Sto. Tomas of Baguio City, Benguet, there are easy trails, fair trails, and of course, there is the Andolor Trail. If you have good cardio and enough hiking experience, then you are now ready to face one of Cordillera’s toughest trails. The said route to Mt. Cabuyao and Sto. Tomas is extreme because aside from the never ending road, you will also endure a lot of leeches along the trail. Aside from this trials, I can say that your climb will be fun. You can enjoy freshing up in a lot of water stations and you can also take a bath in what the climbers call “river” before you start your actual ascent. There are also a lot of lemon trees along the way and you can gather them if you like because the natives won’t mind it. You also have two choices for you campsite, you can camp near where the cows eat their grass, it is a clearing, or you can camp in the saddle (just be cautious if you climb during the wet season in the Philippines). You can also enjoy the view of Mt. Pulag, Tabayoc, Singkalsa, and Panotoan which are the four highest mountains in the Philippines. Dare to trek through Andolor and you will surely have an adrenaline filled sight seeing. Pristine and secluded, the beach of Anawangin Cove is fast becoming a popular tourist destination near the Subic, Zambales area. Surrounded by pine trees and carpeted by volcanic white sand from Mt. Pinatubo’s eruption, Anawangin cove looks like a winter scene in the tropics. The sand is very fine and beach very wide. During low tide, the beach is very long and wide and the waters calm, making it ideal for swimming. Sample pictures here and here. You might also want to check the near Capones Islands. Mt. Pulag is the highest point in Luzon, giving it the name “The Rooftop of Luzon”. There are several trails going to the peak and Ambangeg trail is the easiest. 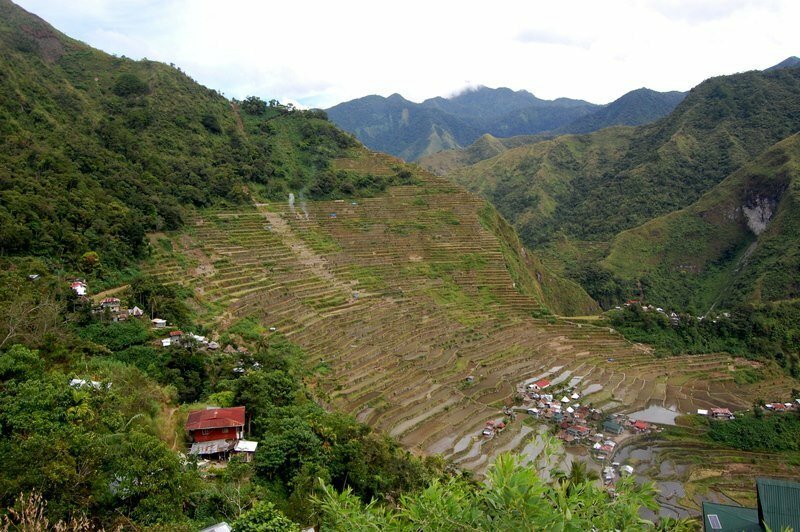 It is located in the Benguet, Ifugao and Nueva Vizcaya provinces in the Cordilleras Region. It is called the “Salad Bowl of the Philippines”. When you start climbing Mt. Pulag, you would be starting on high levels already, so be prepared about this. Everybody knows Baguio City, the summer capital of the Philippines. You can make arrangements with jeepneys there to bring you up to Badabak Ranger Station where you were to start. You can arrange jeepneys with Emerita Tamiray @ 639196315402 and you can fax up your plans/itineraries to her (074) 444 7428 as she is the DENR Park Superintendent there. There used to be another guy who is known to every mountaineer, Mang Roger but he was shot dead just this year. If in need of an extra tent, one may be rented at the Ranger Station for P75. As for guides, the rate is P500/guide for 1-5 persons, and P100 for each addition person thereafter. The maximum number of persons/guide is 10 (P1000) but with 11 persons, the cost is just (P1100). Porters may also be secured at P300/day. Check this out for pictures.